As 2015 draws to a close, we would like to wish everyone a joyous and prosperous new year. We thank you for your patronage and look forward to serving your passion for collecting in the year ahead. Chrysler’s role as a tank manufacturer during World War II is chronicled in a new, six-minute documentary featuring its role as a supplier of military weapons to Europe during the war. The release of “Automakers and the Arsenal of Democracy” was timed to coincide with the 75th anniversary of President Franklin Delano Roosevelt’s historic “Arsenal of Democracy” radio broadcast on Dec. 29, 1940. Whether you’re a landlubber or ruler of the seas you’ll be happy to learn that six additional ships are being added to the growing fleet of DeAgostini 1:1250 warships. The six comprise four British and two German warships and include the HMS Warspite, HMS Ramillies, HMS Exeter and HMS Rodney, along with the Kriegsmarine’s Admiral Scheer and Tirpitz. Look for the latest squadron to weigh anchor some time in February. Dragon has indicated that DRR60656, its first of two 1:72 scale Panzerkampfwagen Ausf. J medium tanks, is now en route to us and expected the first week of January. Along with numerous restocks, two long sold out 1:35 scale vehicles also make up the consignment: an Elefant tank destroyer (DRR61004) as well as a German Morser Karl Super Heavy Self-Propelled Mortar (DRR61010). Both should sell out quickly since its been a long time either vehicle has been available for sale. In mid-January, their second Panzerkampfwagen Ausf. J is on the docket (DRR60657) along with a pair of US M103A1 heavy tanks (DRR60691 and DRR60692). Here again, these vehicles have been heavily pre-ordered, so we are not sure if we will have any available for general sale once we fill all of our pre-orders. Several years ago, we decided to discontinue the Gaso.Line line of military vehicles and accessories, in part because of high shipping costs since they had to be imported from France. With the reduction in the price of oil and rising value of the US dollar vis a vis other forms of currency, we decided to take a second look at this fabulous line. We are happy to report that as we close out 2015, we have decided to once again resume shipments, and hope to start taking delivery of their products in the first quarter of 2016. Unlike their previous efforts, which came in white cardboard boxes, their all-new line of Master Fighter 1:48 scale military vehicles comes packaged with an etched display base, acrylic cover and attractive outer box (as seen here), which more closely resembles some of the larger manufacturers in the military space. And, with the resurgence of 1:43 scale military vehicles, courtesy of Eaglemoss, Atlas Editions and Altaya, these vehicles can be displayed side-by-side with these crowd favorites, or with some of the older Gaso.Line military vehicles that have risen in value over the years. With the New Year looming, and several projects already in the queue, we hope to begin listing all of the Master Fighter vehicles and figures sets we intend to bring in shortly, and can start taking pre-orders immediately thereafter. The Motor Pool’s After Christmas 10% Off Sale! We hope everyone had a joyous and festive holiday season, giving and receiving gifts that put a smile on everyone’s face! If you’re still in the holiday mood, we’ve got good news for you because beginning December 25th, we will be launching our annual “After Christmas” 10% Off Sale! You can apply a 10% off discount to any item listed on our web site (save radio controlled vehicles and the Century Wings line) including back orders, pre-orders and special order merchandise, as well as anything listed as being in stock. Please enter discount code ” TMP148” in the coupon box just prior to final checkout. Sale ends Sunday, January 10th, 2016. May not be combined with any other sales discount. Happy Holidays from The Motor Pool! Just wanted to take a brief moment to wish everyone a merry Christmas and joyous New Year. We also wanted to thank everyone for their continued support as we enter our sixteenth year of doing business. We’ve got some fabulous plans in the works to make your shopping experience even better while staying up with all of the latest advances in technology. Also, we will be in-and-out over the next few days and wanted to remind everyone that we will be closed for vacation from January 9th-17th. If you like ’em big and beefy, and we’re not talking hot dogs here folks, then you may want to check out Altaya’s brand new range of 1:43 scale military vehicles headed to market. 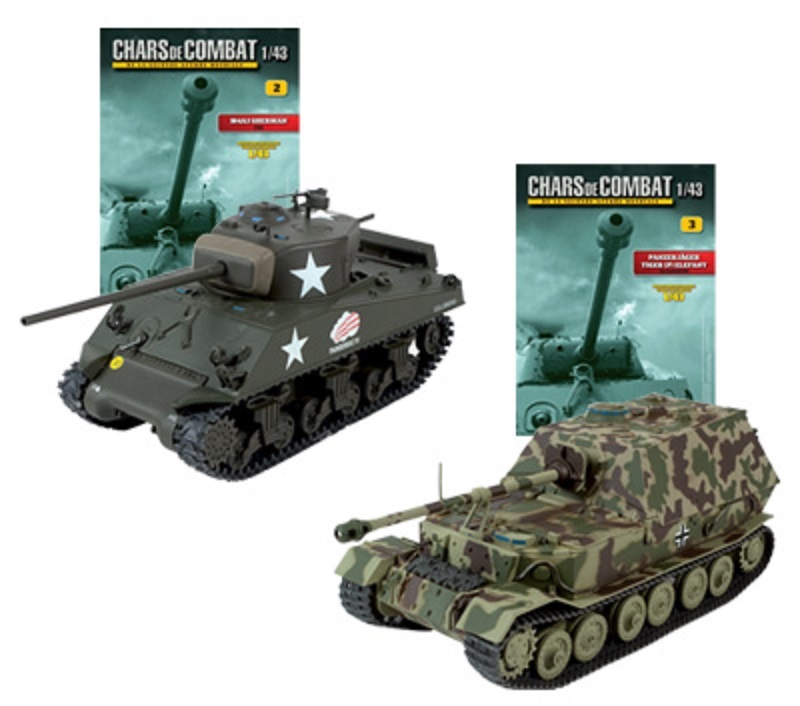 Thus far, four vehicles are being shown on their web site: a US M4A3 Sherman medium tank, German Tiger I heavy tank, Elefant tank destroyer and Jagdtiger heavy tank destroyer. While we don’t have pricing or dates of availability just yet, it appears as if the line will be affordable and broad, likely designed to appeal to collectors of the Eaglemoss and Atlas Editions 1:43 scale ranges. We hope to have more concrete information shortly. Fancy Yourself a Shuttlecraft Pilot? While a transporter may work for some fleet personnel to get from point A to point B, its sometimes safer to hop aboard a Star Trek shuttlecraft to avoid getting your molecules whipped around the galaxy. 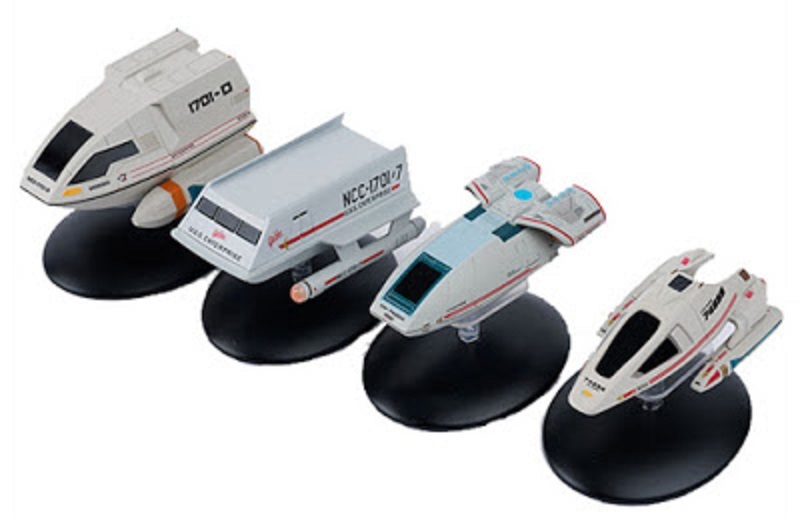 That said, we are now accepting pre-orders for the Eaglemoss Star Trek Shuttlecraft collection, which is expected to arrive this January. 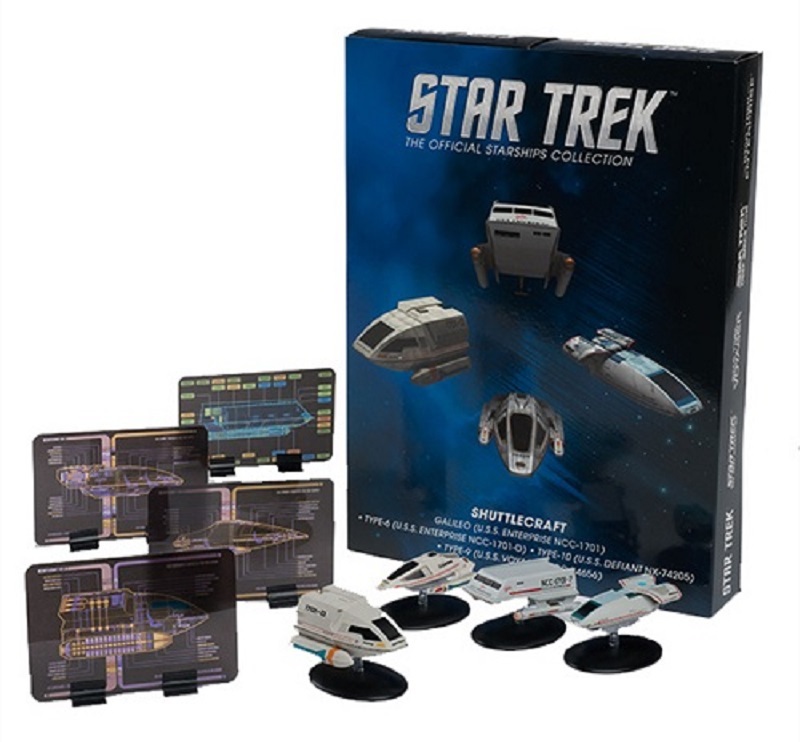 The set is specially packaged and comes with four different shuttlecraft as seen in the televised series and some of the feature films. Also included is an eight-page booklet (measuring 150 x 210 mm) which exclusively contains “in-universe” information accompanies each model. It features master systems display illustrations (okudagrams) newly created for each issue by Mike Okuda. These schematics are also printed onto 120 x 80 mm translucent plastic sheets which can be mounted on (included) clip stands. Originally we had been told that Corgi would not release a winter catalog this year. In a strange turn of events, the manufacturer belayed that ordered and announced a bunch of newcomers to their Aviation Archive portfolio, some of which are due out right after the holiday season concludes. 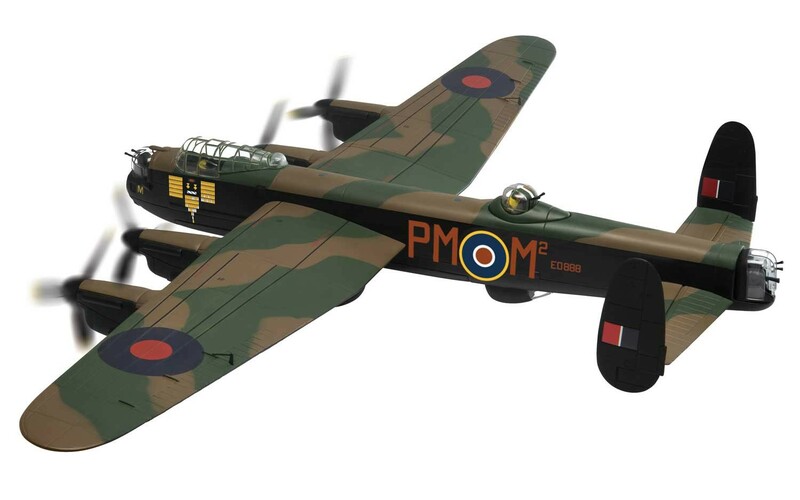 One of the key releases is this Avro Lancaster Mk. III heavy bomber (AA32624), which is slated to make its initial bombing run in January. We’re currently in the process of listing all of the notable introductions expected the first half of 2016, but decided to post this one first just to whet your appetite.